Eclipse, the third book of the Twilight Series by Stephenie Meyer and it is by far the most interesting book of the series I have read so far- fast paced, happening and truly a page turner! If you really want to enjoy a book in a series, you should always start from the first book of the series as the story begins there and keeps on building on it and many a times there are references in the later books of some incidents in the former books. The same is the fact with Eclipse. The story starts more or less from where it was left in the second book. With the kind of luck Bella has, danger can't be away from her for a long time. So, we find her again in mortal danger and even with the gifted abilities her vampire friends have, they are unable to find out who is the enemy in the present context. That adds to the uncertainty, thrill and suspense in the novel which keeps on building and keeps the reader glued to the book till they have turned the last page. As I said, a lot is happening in this book. Unlike the former books in the series I didn't find a dull moment. Of course, Jacob Black adds to complexities and problems in Bella's life and Bella is forever in dilemma about how she feels for him. 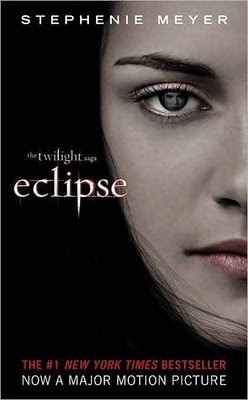 I know a few people who hated the 'Twilight Series' and some who loved it. I can safely say I fall in the later group. But, among the characters, I like Jacob more than others. Edward is too perfect and Bella is somewhat flawed and weak. I find Jacob's emotions more human and can relate to them better. I hope to read the next book in the series soon. I find the series entertaining, if nothing else. You can find the review of the previous book of the series here and here. Linking it to A2ZChallenge for Letter E.
"Once I mastered the simple alphabet, Mr Holcombe introduced me to a few simple words: 'dog, 'cat', 'mum', 'dad'. That was when when I first asked him about my dad, hoping that he might be able to tell me something about him." This is the third book by the author, his first one being 'The White Tiger' which won the Man Booker Prize in 2008. I had read this award winning book sometime last year and had enjoyed it. 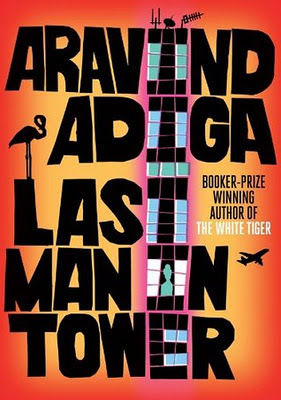 Though 'Last Man in Tower' explores a story in similar lines, I cannot say the same about this book. No doubt, it is a very well written and a well researched story but there is something about it being so pessimistic, that it kind of creeps on you and leaves you devastated in the end. 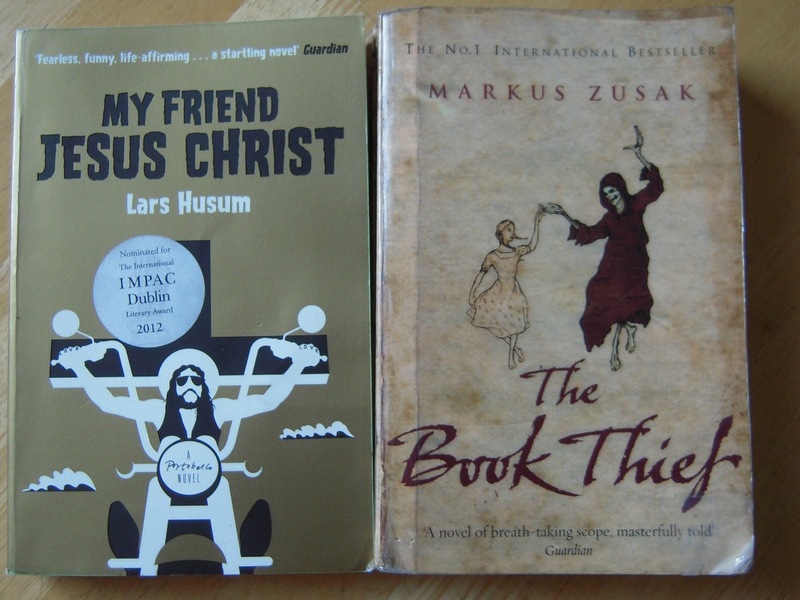 I cannot help but do a small comparison of the two books I have read of the author. The White Tiger was fast paced but Last Man is Tower starts slowly. The author has spent a good number of pages in painting - the characters,their emotions, pictures from their daily life, the surroundings and the overall atmosphere. It adds to ambiance in the novel but at some point it starts to creep on the readers. I felt, the book radiated many negative vibes and that is why it took me a long time to finish it. I have realized that what I read affects my moods and emotions in some way of the other and even after reading a few pages, I felt heavy and had to keep it aside. In 'The White Tiger' protagonist was from the lowest strata of society and it was rich rags to riches tale. It dealt with how an honest person can get corrupt in the process of seeking power and money. Last Man in Tower is about the middle class people who are forever trying to elevate their status in society and when an opportunity knocks on their doors, they are ready to stoop as low as can be possible to avail of it, even if that involves sacrificing some one's life! That is the cliche, as much as I can see that there is truth in the story, I don't believe there cannot be exception to it. Real estate developer Dharmen Shah’s offer to buy out the residents of Vishram Society—a formerly respectable, now crumbling apartment complex that abuts the infamous Dharavi slums—is more than generous. But one man stands in the way of Shah’s luxury high- rise: Masterji, a retired schoolteacher who will not leave his home in Vishram’s Tower A. Shah is a dangerous man to refuse, but as the demolition deadline looms, Masterji’s neighbors—friends who have become enemies, acquaintances turned co- conspirators—may stop at nothing to score their payday. An electrifying, suspense-filled story of money and power, luxury and deprivation, peopled by brilliantly drawn, unforgettable characters, Last Man in Tower exposes the hearts and minds of the every men and women of a great, booming city—ordinary people pushed to their limits in a place that knows none. With the real estate prices sky rocketing in India, there can be such instances but, is really all humanity wiped out of the Indian middle class? It is a powerful novel with a theme that is relatable in many ways but I do feel it paints a very wrong picture of Indian society, the middle class in particular. I didn't really enjoy the book but I would not stop any one from reading it. It certainly left me squirming with uneasiness but it did me ample thoughts to ponder on! I have seen the second book of the author, Between the Assassinations, in the library but I am wary about picking it up. I think I will leave a good long gap before reading another depressing and pessimistic story about India. Linking it to A2ZChallenge for Letter L and South Asian Challenge. I am here with yet another post of my Lucky Library Picks. You can see other posts of this series here. This week I have these two books. Seriously, I have picked up this book on impulse. The blurb is interesting and I had flipped a few pages of the book before picking it up. 'A remarkable tragicomic tale about trust and friendship and how individual actions dictate the lives around you. Arresting' - Says Financial Times. I had actually half read this book and had to return it to the library due to my India trip last year. So, reading it again has been long due. Glad to have spotted it in the library. If you have something to share, do leave a link. Thank you for stopping by. Cheers! After a decadent Kulfi, it is only reasonable that I share something really healthy and this salad is one of the healthiest thing I have made of late. Without much ado lets see how I made it. This salad is definitely going to add to my presently almost non existent salad recipes on this space. It is not that I do not make salads, I just feel that they are something too simple and too easy to be blogged about. I love sprouts and felt that I must blog about this salad. "Moong beans, apart from being a good source of protein also contain useful amounts of fibre, potassium, and B-vitamins. They contain low levels of fat, cholesterol and sodium. It is useful for those of us who want to increase their alertness and mental abilities. 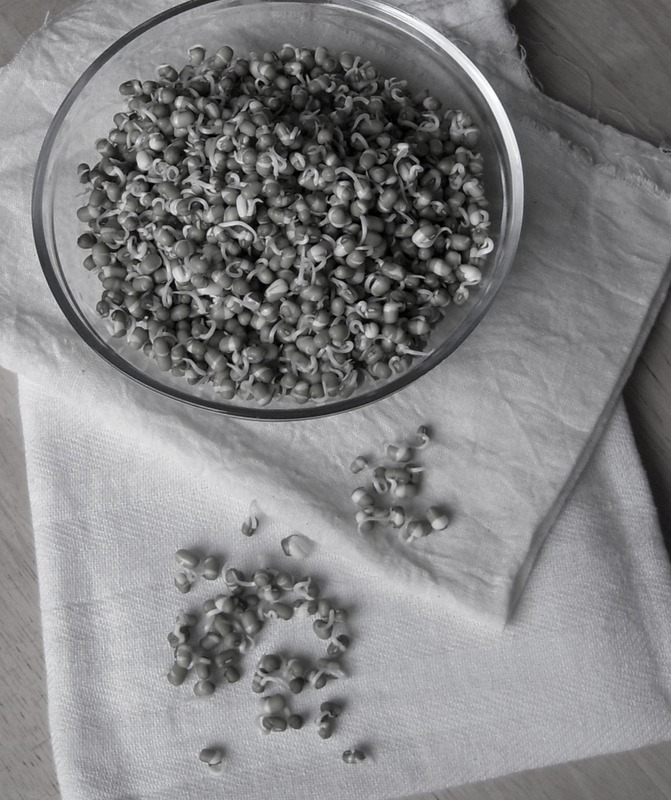 Phosphorous is also necessary for healthy bones and teeth, a fact which makes sprouted seeds desirable for babies and children." How to make moong sprouts? Soak the moong dal overnight and it will increase to twice its volume. 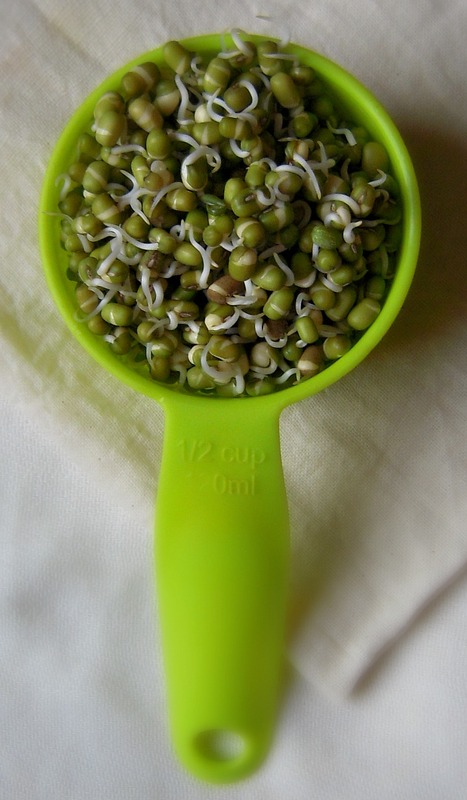 Drain off the water and keep the moong dal in a warm place for 12-20 hrs for the sprouts to grow. The sprouts grow faster in warm environment. Sometimes, I heat the oven at 50-75 C for 5 minutes and then keep the soaked beans there, for the sprouts to grow. Lots of chopped coriander leaves. 1. The moong sprouts can be cooked or used raw in salad. You can steam them too. I usually pour very hot water over a bowl of sprouts and cover it for 5 minutes and then use them in making my salad. 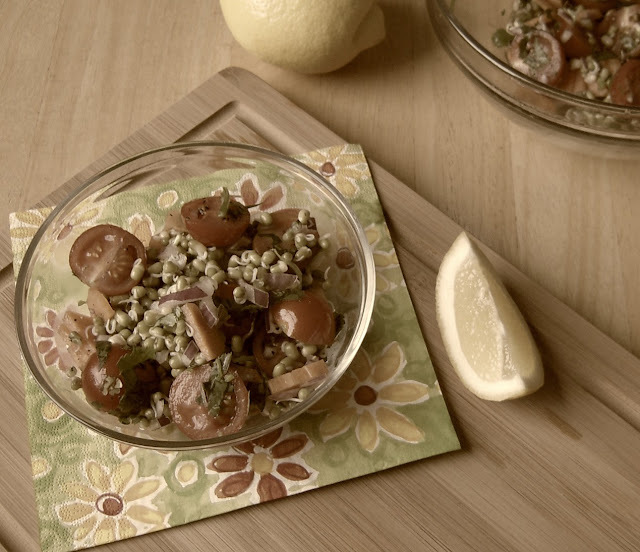 The sprouts thus have a crunchy texture than the cooked sprouts. 1. 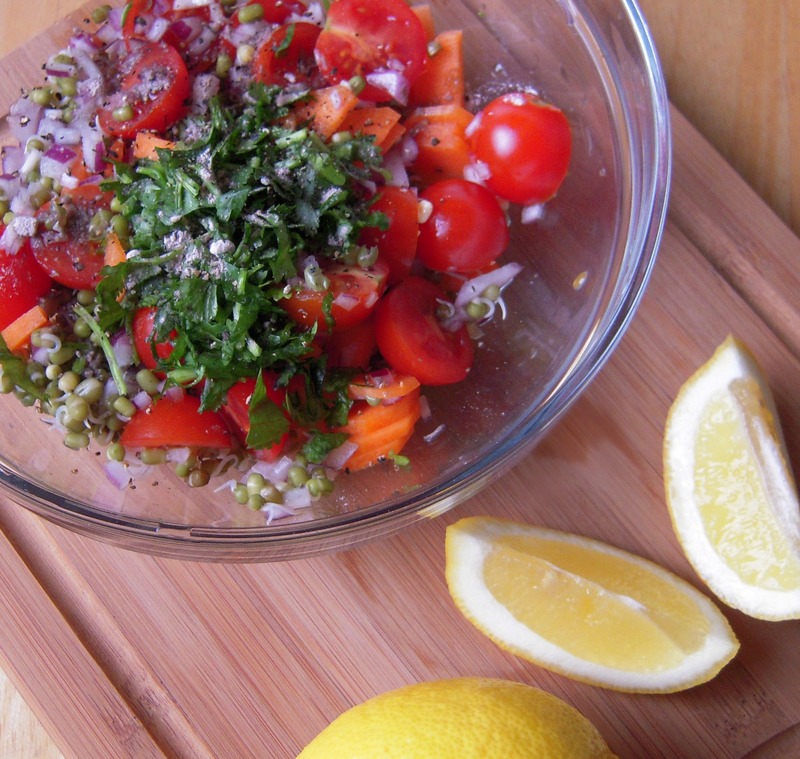 Toss all the ingredients into a salad bowl and shake well. Adjust the seasoning to taste. Serve immediately. Note: You can add any veggie of your choice. For example: chopped radish, cucumber, cabbage etc. Linking it to my event - Healthy and Hearty and to Only Sprouts Event guest hosted by Priya and started by Pari. 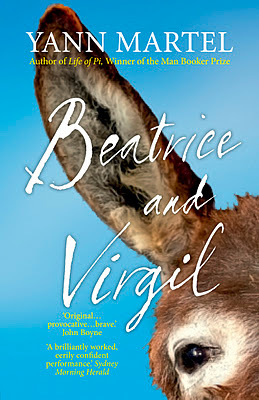 "This story is the story of a donkey named Beatrice and a monkey named Virgil. It is also the story of an extraordinary journey undertaken by a man named Henry. It begins with a mysterious parcel, and it ends in a place that will make you think again about one of the most significant events of the twentieth century. Once you have finished reading it, it is impossible to forget." I was HIGHLY intrigued by this blurb, so much so that I put aside the other books I had been reading and started with this one. Also, since the book was barely 200 pages, I didn't think it would take too long. The story started with a writer named Henry whose previous book was a huge success and he is working hard on a book about 'Holocaust'. He tries to present the stories from Holocaust in a different and 'never told before' style but his style and endeavors are rejected by the publishers. He decides to take a break and shifts to a different city and puts all the thoughts about his book at the back of his mind. One day he receives a mysterious box containing excerpts from a play by Flaubert and another play which perhaps the sender himself had penned down. Henry traced the letter to a taxidermist and coincidentally his name was also Henry. The taxidermist reads out his play (whose main characters are stuffed animals present in his workshop- Beatrice, the donkey and Virgil, the howler monkey) to Henry.The first scene of the play was interesting where Virgil is trying to explain to Beatrice how a pear looks and tastes like. But from then onwards, the play is a jumble and I found it rather boring, crude and abstract. "Here was irrefutable proof that he was using the Holocaust to speak of the extermination of animal life. Doomed creatures that could not speak for themselves were being given the voice of a most articulate people who had been similarly doomed. He was seeing the tragic fate of animals through the tragic fate of Jews. The Holocaust as allegory." That is so bizarrely convenient! Here was an author whose book about Holocaust has been rejected and he comes across a Nazi who had somehow escaped detection and was living a solitary life. I felt aghast as a reader, here I was reading page after page trying to fathom what the author is trying to say and then in just a few lines you sum up the novel. Then in fact, a second thought dawned on me - was the writer Henry in this book Yann Martel himself? I do not know that for sure. "To my mind, faith is like being in the sun. When you are in the sun, can you avoid creating a shadow? Can you shake that area of darkness that clings to you, always shaped like you, as if constantly to remind you of yourself? You can't. This shadow is doubt. And it goes wherever you go as long as you stay in the sun. And who wouldn't want to be in the sun?" " If you are pitched into misery,remember that your days on this earth are counted and you might as well make the best of those you have left." Linking it to A2ZChallenge for Letter B. 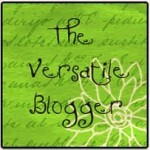 Let me just stick to the point, I am very happy to receive 'The Versatile Blogger' tag from a lovely blogger friend- Bhargavi. I love her blog ( and I am not saying this for the sake of it). Her blog is an epitome of creative art, beautiful sketches, thorough book reviews and everyday chronicles. Thank you for tagging me, I feel really honoured. Since this is my first tag it is really special. But this tag comes with some rules and they are the real fun part of it and tough part of it as well. - I love reading. Bookstores and libraries are the places for me and I can be there for hours without noticing the time. - I had NO interest in cooking before marriage. I would not be found anywhere near it then. Things are different now, cooking was a necessity when I began, it's an area that I am too eager to explore. - Baking is therapeutic for me. It is a stress buster. When I am happy, I bake to celebrate and when I am not happy, I bake to uplift my mood. - I love cooking more than eating. - I am an absolute zero when it comes to makeup & fashion sense. Listing out these 7 bullet points for myself was tough. But, I did manage to pull it off! Yayy! This is one blog I follow religiously. 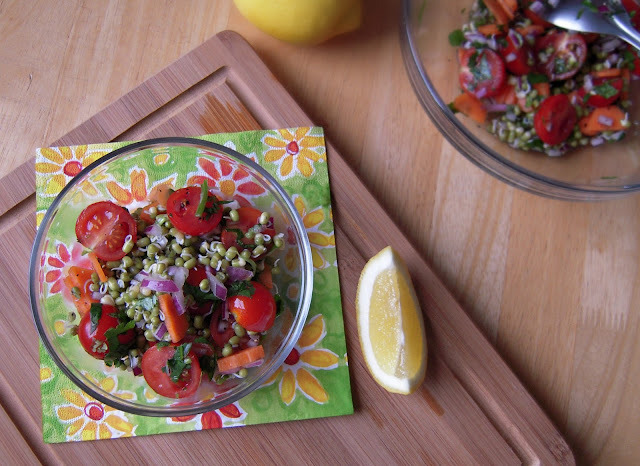 Her space is full of innovative, interesting, delicious and healthy recipes. A must space for any food lover! 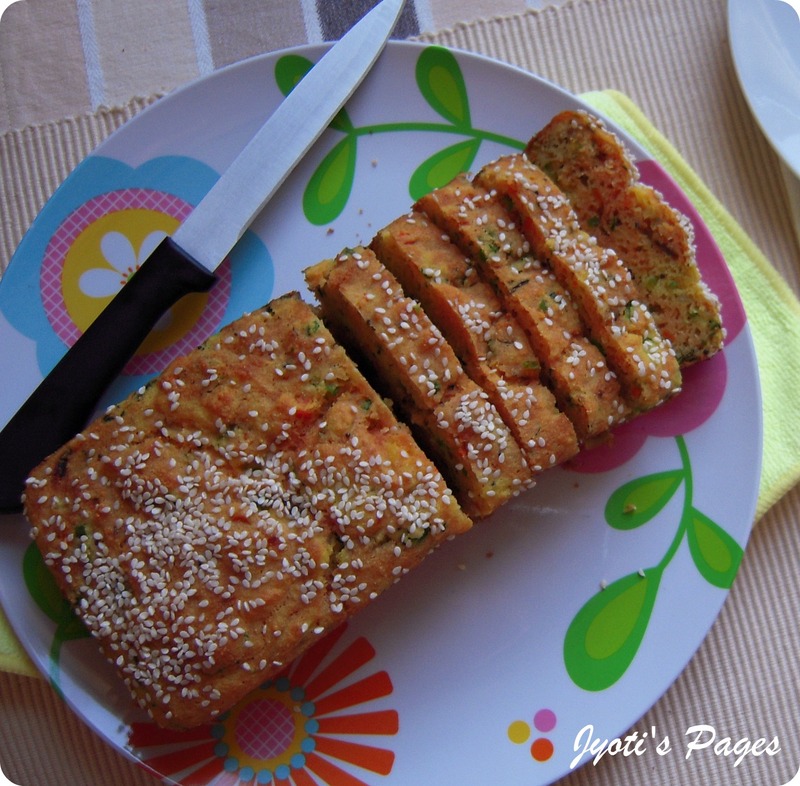 A den of lip-smacking recipes with drool-worthy pictures. I have literally bookmarked all her recipes. Smita of Books, Life and More. One of the most popular blog around. Her posts are refreshing and fun to read. I loved her 'Senseless Saturday' series and I hope she does more posts on that series again! Hema of Tell A Story My Way. One of the first book blog I started following. I have picked a number of books after reading her reviews. Lindy of LindaLouMac Book Reviews. She is a veteran book lover and her book reviews are very informative. A must for book lovers. This is one blog I started following recently. Her posts on varied subjects including books are food for thought. Another must blog for book lovers! A passionate food blogger and baker and a budding photographer. I am awed by her poetic creations and I hope she creates a blog to share them with the world. A fun, bubbly blogger who blogs about food, loves reading books. I hope she blogs more often! A blog I recently discovered and spent a lot of digging into her posts. You have to visit her space. Her space is a haven for book lovers. I have picked up a lot of books after her recommendation and they have made to my favourites list. He strikes me as an adventurous person, in love with life and all it has to offer. His thought-provoking posts are food for the soul. His love for running is commendable! You will be dazzled by the pictures on her blog, they are a treat for your eyes. A passionate foodie and an awesome photographer. Another food blog, I have started following recently. 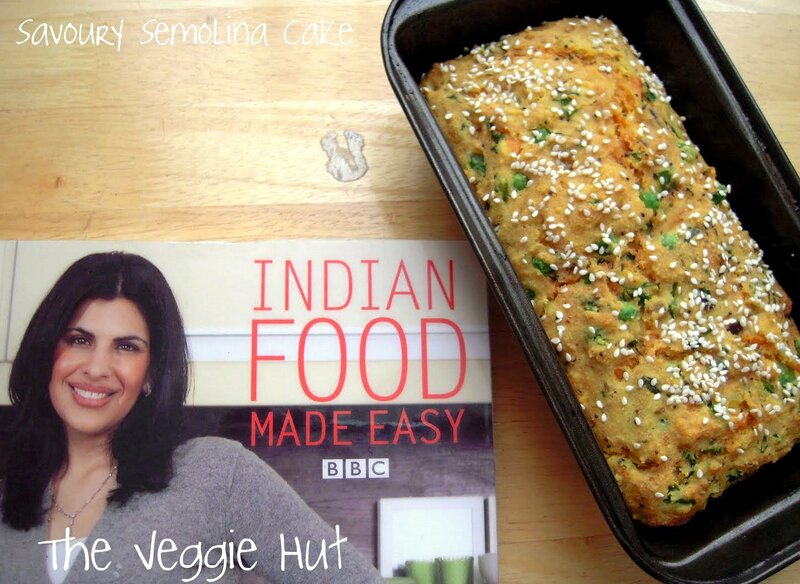 She has a great collection of recipes and the pictures will definitely make you hungry. A vegan food blog, I have been silently following for some time now. Her photographic skills are awe-inspiring! I have recently finished reading a book I didn't enjoy much. So instead of writing a bad review and cribbing about it, I decided to do a food related post again. The book review can wait for a while. 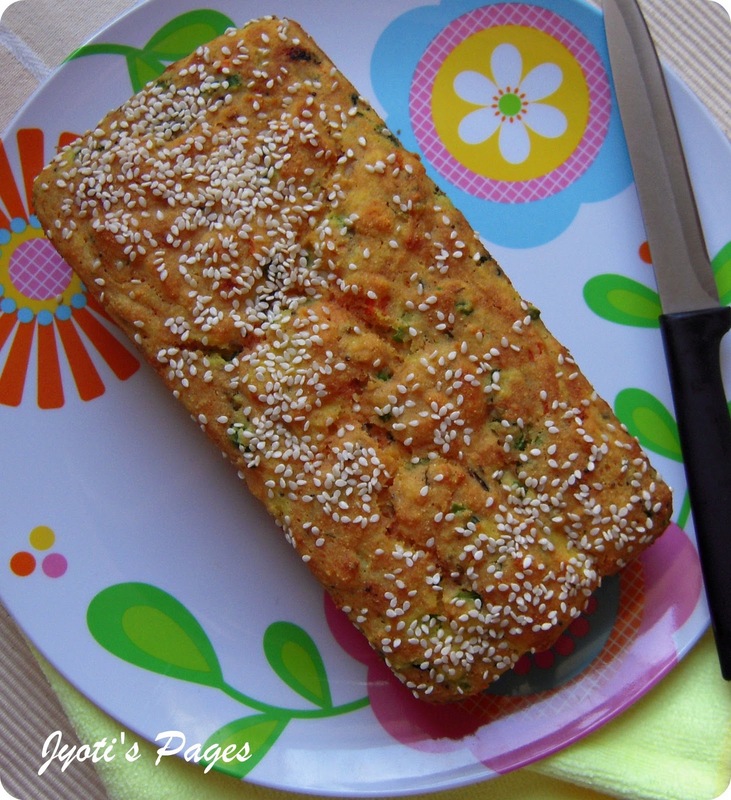 This recipe has been lying in my drafts for months now, I thought it would be good to post it now since, I have a food event running here with the theme -'Healthy & Hearty' and this one of the healthiest snack/bake I make regularly. It can be served for breakfast or afternoon tea and you don't have to worry about the portion size at all. 2 tsp vegetable oil, plus extra for oiling the loaf pan. 1 cup plain low fat yoghurt. ¼ cup finely chopped carrot. ¼ cup chopped bell pepper. 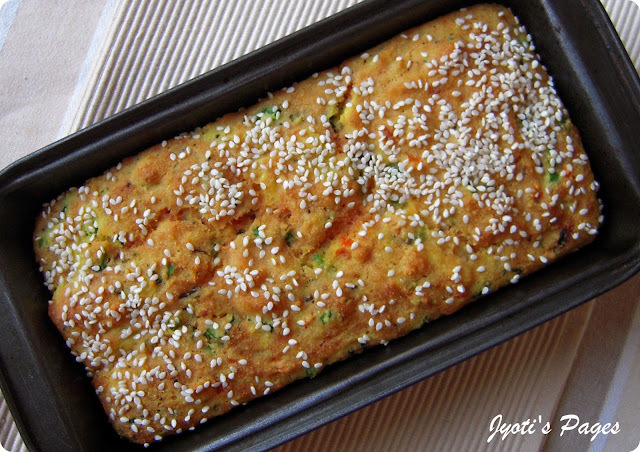 1.Preheat the oven at 180 C and oil a medium loaf tin. 2. 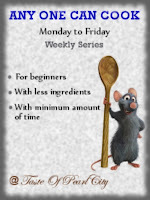 Mix together the semolina, yogurt, water, salt to make a batter of a medium thick consistency. Heat the oil in a small saucepan. Add asafoetida, mustard seeds, curry leaves, green chilies and cumin seeds and cook for about 20 seconds until the mustard seeds have popped and the cumin is aromatic. Add the veggies and spices and cook for 2-3 minutes Stir into batter. 3. Stir in the bicarbonate of soda and immediately pour the mixture into the prepared tin and sprinkle over sesame seeds. Bake in the preheated oven for 20-25 minutes. 4. The cake is ready when a toothpick inserted in the middle comes out clean and when the edges are crisp. Leave the cake to cool in the tin. 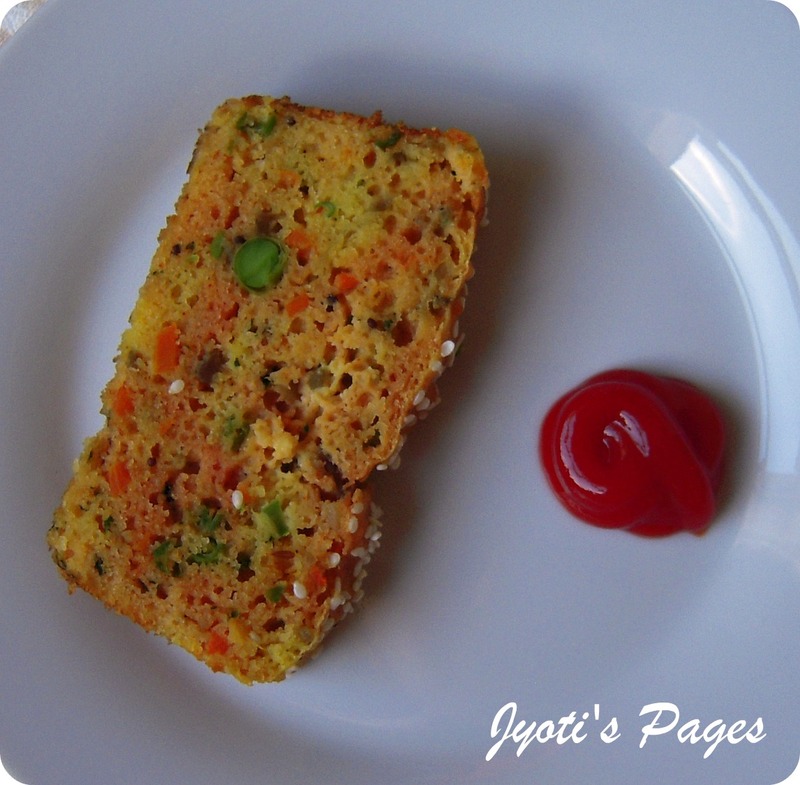 Slice when cooled and serve with the chutney of your choice or ketchup. Linking it to my event- Healthy and Hearty. Thank you for stopping by! Cheers! When you think dessert, generally a calorie rich dish comes to mind. Well, think again! These blueberry fools are actually low fat and still lusciously creamy and indulgent. I received Rachel Allen's Easy Meals as a gift this Christmas and as I was browsing the book, I came across a very simple dessert named Apple Fool. Rachel chronicles that it may be because it is so simple that any fool can make it. Then she adds on that the word fool is derived from the word fouler, meaning to crush or press. While the original recipe from the book had double cream in it, I substituted it with low fat hung curd and instead of apples, I used blueberries. 1. Line a muslin cloth over a sieve and place it over a large bowl. Pour the yogurt over the muslin cloth and let it hang in the refrigerator for 2-3 hours or over night. The yogurt will reduce into half its original volume. 2. Add blueberries, sugar , lemon juice and zest in a pan and heat it till it bubbles and blueberries and soft and leaves out it juice. Remove from heat and let it cool completely. Our blueberry compote is ready. 3. In another bowl mix the hung yogurt, vanilla and sugar. In 2 serving glasses pour the yogurt mixture and blueberry mixture alternately till used. The layers need not be perfect, rather it should give a zigzag pattern. Keep it in refrigerator till needed. Serve cold. Enjoy! Note: You can substitute the blueberry with any kind of berries, cherries or even substitute the berry compote with pureed fruit like mango, pear etc. 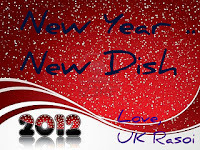 I have already written here that I had been to London for new year. This trip was memorable. I have been there before and have been to all the popular sightseeing place the city has to offer. So this time, we planned our trip differently. We spent a good amount of time enjoying Indian food at Indian joints in Wembley and Southall. Southall had been on top of our list to visit and we really enjoyed 'the desi' experience. Indian style market at Southall! Of Course, I had to eat here! 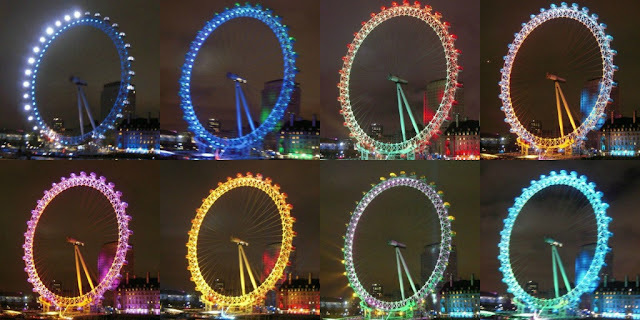 By 4 pm on new year's eve, we were in the fireworks show viewing area near the Big Ben and London Eye. The crowed swelled by the hour and we were only glad to have reserved our spots early. It only at 10 pm things go started there with music and the lovely changing hues of the London Eye. In simple words it was just gorgeous! The fire works that happened at sharp 12.00 am and lasted for about 11 minutes. It was one of the most spectacular show and something I will cherish forever. It left me dazed, stupefied and dumbfounded and I did not dare to click a picture, least I would miss something. Also, I knew my camera would not be able to capture even 1% of it. Thanks to BBC for the high definition video on youtube. I have watched it several times again and it still leaves me speechless. Ever since I started this meme, I go to the library with renewed interest, enthusiasm and hope and have been picking up interesting titles. This week for 'Lucky Library Picks' I have 2 books to share. I read Life of Pi by the author last year and after a difficult start, that book has been one of those enlightening reads that I cherish. To pick Beatrice and Virgil by Yann Martel seems to be a natural progression to me. 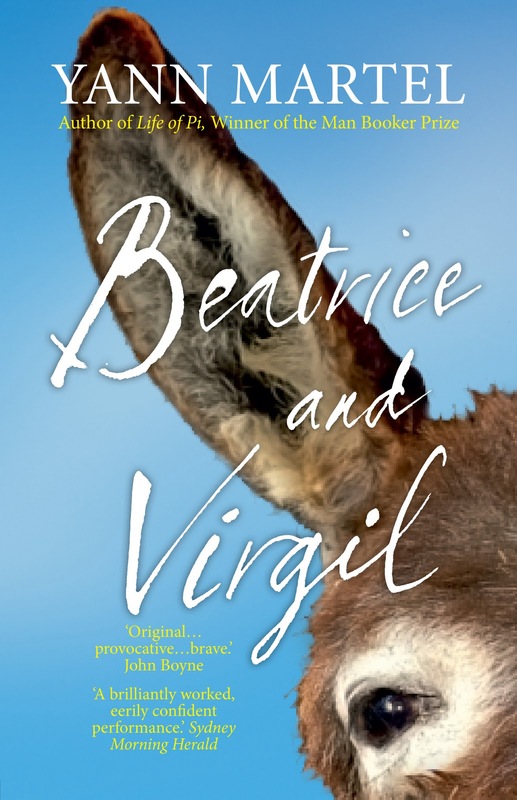 The blurb says, "This is the story of a donkey named Beatrice and a monkey named Virgil. It is the story of an extraordinary journey undertaken by a man named Henry". Isn't that intriguing? Well after the tiger in Life of Pi, I am in for a donkey and monkey in this novel!;-P! "I used to be human once. So I'm told. I don't remember it myself, but people who knew me when I was small say I walked on two feet just like a human being". That sounds crude but it was enough to stir up my interest. If the same thought is crossing your mind as mine then let me reassure you, I will pick some books without any animals in them next time.:-)! Do you have anything to share about Lucky Library Picks, so share your link! You can check my other Lucky Library Picks post here. For January Sweet Punch Divya chose a gorgeous, sinful, decadent 'Banoffee Pie' recipe from Swapna's Cuisine. I was in a dilemma, whether to go for it or not. There were a couple of reasons. Banoffee Pie is anything but healthy, it is loaded with calories and calories and calories! But, it is definitely outrageously DELICIOUS, so much so that all your resolutions to eat healthy will go behind closed doors. Another reason was my DH loves banana as a fruit but not anything with bananas in it. So, cooking this only for myself didn't seem to be a very good idea (I nearly fainted when I stood on my bathroom scale last time. Sigh! Old story!). Still, I went ahead and made it as making dulce de leche had been high on my 'to make list' and to justify it to myself I made them as trifles (small serving, so less calories). I made only 2 servings and the rest of dulce de leche is making something else. I will come up with that later. First thing first: How to make dulce de leche? 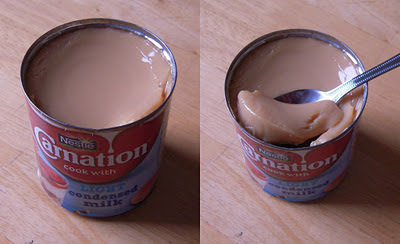 It is nothing but cooked condensed milk. I went for the conventional method as suggested in the recipe. Put the can of condensed milk, unopened, in a large pan, cover with water, bring to boiling point and boil for 2 hours on medium heat. Top it with boiling water from a kettle as needed. The can SHOULD remain covered in water, otherwise there is a risk of the can bursting open. Remove and leave to cool completely. If you cook it for longer, it will have a darker color than that shown in the picture below. 1. Mix the butter and the powdered biscuit and divide it into the two serving glass. Press it to form a layer. 2. Pour dulce de leche into each glass equally forming a layer followed by banana slices and them top it up with whipped cream. Dust it with cocoa powder. Keep it in the fridge for an hour before serving. After reading The Palace of Illusions last year, I was looking forward to read more of the the author's work. That is why when I spotted this book in the library I picked it up. The Book - Arranged Marriage is a collection of short stories centering around Indian women. In most of the stories the protagonist is a woman with Indian roots, settled in America and the story is about her tumultuous journey of life where she is trying to strike a balance between her deep rooted Indian beliefs and modern American outlook. The book has a collection of 10 stories, each of the story is different from the other and yet has something in common. Most of them are sad, some disturbing yet profound. These are stories which will leave an indelible mark in your mind and will leave you pondering. I have only one qualm about the book, as to why the author has stressed more on the negatives of Arranged Marriages. Arranged Marriage is a practice prevalent hugely in India. It is often labeled as an orthodox practice and mostly people from the West find it very difficult to understand, as how such a system could work in first place! But, it HAS worked and I have seen living examples of it. So, I do not think it is fair to explore only the grim side of Arranged Marriages. The author through her stories stresses on the importance of independence in life, of women in particular which I believe is important for every women irrespective of nationality. Even though it is written in Indian context, it stresses on problems which is common to women from all walks of life and so, I think 'Arranged Marriage' doesn't seem to be a very appropriate title. Having said that, I must admit that I could relate to most stories be it 'The Bats' where the woman despite all odds remains faithful to his wife beater husband or 'The Ultrasound' where the woman is asked to abort her child since she is a baby girl or 'Affair' where a husband leaves her wife for another woman. I personally liked 'Meeting Mrinal' where the woman finally accepts her fate and decides to move on in life. Since the author lives in America, I believe that it must have influenced the author's own perspective and the way has brought out the sentiments of the women in the stories. These poignant stories did move me and made me contemplate about various things in life which I take for granted, but, for many it is a dream. Linking it to A2ZChallenge and South Asian Challenge.